If becoming agile, as opposed to merely doing agile, is so successful, how come then, that not all organizations are pursuing a similar path as Zalando? Certainly, there are no shortages of agile methodologies, frameworks, and practices to choose from. From 2010 to 2017, I was working several years in three Berlin-based, fast-growing startups in my capacity as Scrum Master, agile coach, and Product Owner. ‘Fast-growing’ in the sense of this article refers to startups of at least 200 staff strong. Each of the before-mentioned organizations doubled in size each year during a period of at least three consecutive years. All startups built double-sided marketplaces, serving B2C as well as B2B customers. These are my lessons learned on how to become agile as a fast-growing startup, and what anti-patterns to avoid at all costs. you immediately recognize the misalignment of motives and the real agile mindset. abandon the famous “heroic inventor” mental model. To my experience, the challenges of becoming a learning organization can only be handled effectively by self-organizing teams. Their collaboration will lead over time to a ‘team of teams’ structure. This approach requires at any stage the full backing of the C-level. A limited or lackluster support will render all efforts useless. Equally futile by comparison to the lack of C-level support is a bottom-up approach by hacking the existing culture. It usually leads to frustration, and talented people with an agile mindset will seek for better-suited organizations elsewhere. Change is much less appreciated than innovators commonly believe. Organization have an inherent inertia to change, which is a reason that they are successful: they provide stability. However, stability also breeds self-interest at all levels, but particularly at the level of the middle management. There is the ‘what’s-in-for-me’ syndrome: why would a middle manager put his or her career on the line by supporting the agile mindset? Taylorism – or supporting command and control structures in siloed organizations – still pays well today. It results in local optimizations and personal agendas. Also, career & CV optimization efforts are a motivation to be reckoned with. Self-organization, on the other side, needs a different kind of management: teachers, coaches, and mentors. And just relabeling the positions of the old middle management rarely works. There seems to be a belief even among informed stakeholders that scaling an agile organization can be achieved by simply going through the checklist of a successful another startup. One of the favorite blueprints for that purpose is Spotify. You neither understand product discovery, nor product delivery in the 21st century. The idea to install a communication gatekeeper between the product delivery organization and its stakeholders and customers contradicts everything ‘Agile’ stands for. An agile startup does not require a PMO. How to Make ‘Agile’ Work in Startups Then? Apparently, becoming an agile organization is a tedious, lengthy journey. Therefore, the first question any startup should answer for itself, is simple: is it a sales-driven, product-driven or tech-driven enterprise? However, if competition is fierce, technology is advancing rapidly, and big players are investing large amounts, then there is nowadays practically no way around becoming a learning organization. Source: What is Agile? Graphic: By the author. Getting from the processes & tools level to the agile mindset is a daring journey, and no one can guarantee that the endeavor will result in the desired outcome. You started out with a small team, and your way of being agile seems to start working. Your startup is getting traction, new funding, and your investors urge you to hire more people, and particularly to hire more “senior people” from larger organizations. If you are now onboarding five, ten, or 20 people a month, you have a serious issue at hands: how to preserve your original team spirit, your original (agile) culture? This observation is the main reason that you need to protect your nascent agile culture at all costs. Don’t let culture “evolve” by hiring people from (legacy) organizations. A former BCG manager will likely urge to establish a project management office (PMO) because this is the way she knows how to organize work. And as culture tends to follow structure you will strangle your agile culture exactly in this way. There are only two means how to avoid this sort of collateral damage. You need to invest both in diversity and education of every new hire. Ensure that everyone understands why your startup needs to be agile. This learning is not achieved by handing out leaflets. It only works by teaching the big agile picture and winning the hearts and minds of everyone within the organization. 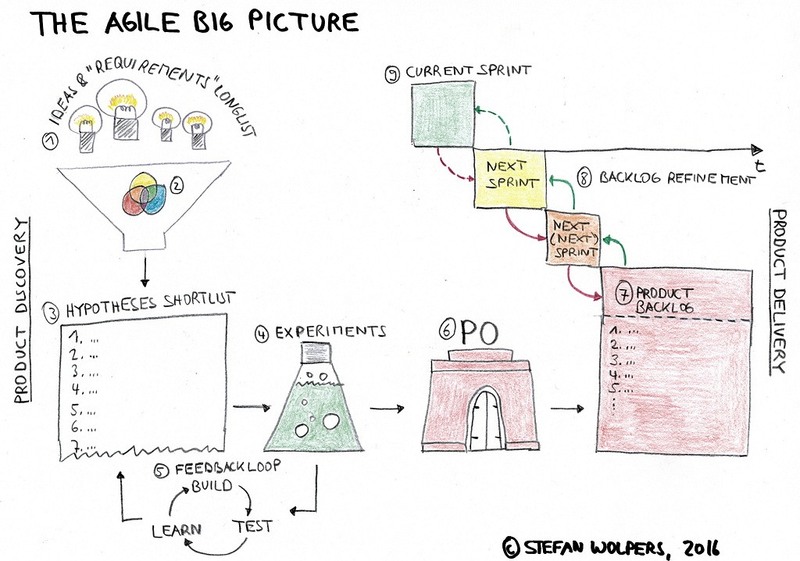 Read more: The Big Picture of Agile. How do you teach the big agile picture, thus winning the hearts and minds of the new hires? Train everybody – without regard to her future position – hands-on in all value-creating activities of the organization. Start with customer care, and steal from Zappos. Plus, and that is my favorite activity, run mandatory workshops with all new hires where they have to prototype a new app. The exercise works for everyone — sales, marketing, customer care, finance, HR… — no specific knowledge required. At the end of the workshop, people either love building products or the product delivery organization earned at least their respect. Both are highly valuable mindsets for an agile startup. Read more: App Prototyping with Absolute Beginners. The agile workspace – the underestimated success factor for agile organizations. It is interesting to observe that even newly designed office of startups that pride themselves to be agile lack proper facilities. Also, the startup-like feast and famine cycle of stuffing of more people into a once generous space until the next move is no longer an option. Whiteboards and other information radiators require space all the time if an agile startup wants to reap their benefits. Looks can deceive: the floor wasn’t that great as an agile workspace. The typical sales pitch goes like: “we need a CRM software, and why would we build something that we can license anyway?” (Which is legitimate.) The initial set-up is small, just a bit of customization, but after a short period requirements from sales start emerging that only can be met by custom development. The general purpose of agile metrics is to understand the current situation better and to gain insight on change over time. An agile metric should, therefore, be a leading indicator for a pattern change, providing an opportunity to analyze the cause of change— and act in time if required. There is no one-size-fits-all approach to become an agile organization. There is no checklist that you can apply. You need to figure out your way. It will take money, brain, and time to do so. You might fail, you will probably plateau at a certain stage, and once your startup stops going forward, it will likely start moving backward. How do you make Agile work in fast-growing startups? Please share your experience with us in the comments. A really nice article and with lots of helpful content. Thanks! Making agile working in fast growing startups for sure has its challenges. Still, I consider one of the huge benefits in startups that the team usually is very young, open to any new ideas and – of course- already quite familiar with agility and very much used to give further improvements a try. Besides running an own SW startup I have been involved in projects at corporations to implement Agility. This required explaining the ideas of Agility, SCRUM etc., finding supporters on operational level, define pilot project and prove to be better than before. If anyone is willing to exchange lessons learnt on this topic, that would be great. Cool article with interesting Dos and Don’ts on agile. To my experience being truly agile is a big challenge, especially, since there is no one-size-fits-all approach. There are as many agile variants in the world as there exist agile companies. So, being agile means negotiating its implementation continuously. Here, startups do have a competitive advantage. They can ingrain this concept into their company-DNA from the beginning of. However, even for them “agile” does not come offhand. Experienced support is vital when implementing or transforming towards being an “agile” organization. Hi Stefan, thanks for sharing. Interesting article! Thanks for the kudo, Louise. I am curious to learn more about your experience. Excellent article. I read it through quickly once, and I’m bookmarking to read again later.